Buckle up for fast and furious nightlife action with your hot persona and slammin' race car. Drive through illustrious cities and collect chips to accelerate your speed. Purchase a stylized car in the garage and match three chips in a row to clear the level. Need that extra edge? Match four chips for an extra move. 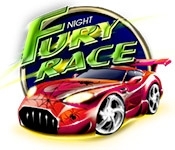 Win hot trophy cups for speed and skill in Fury Race, a Match-3 mega hit.